The Diagenode Bioruptor is a state-of-the-art sonication system, cited in more than 2,000 publications. The Bioruptor can simultaneously process up to 16 samples with tube flexibility from 0.1 ml to 50 ml to accurately achieve random and unbiased shearing for different fragment ranges. The closed tube format prevents sample cross-contamination, allowing unmatched reproducibility. Using a highly-controlled ultrasonic energy with ACT (Adaptive Cavitation Technology), a non-contact, parallel-processing and isothermal technology, the Bioruptor is ideal for chromatin shearing for chromatin immunoprecipitation (ChIP), genomic DNA shearing for next generation sequencing, RNA shearing, cell and tissue disruption, and much more. Shear chromatin to the exact fragment size range needed for downstream ChIP-seq and ChIP-qPCR. The most important steps for a successful ChIP include both cell fixation and lysis, and chromatin shearing. Diagenode’s Bioruptor uses state-of-the-art ultrasound technology to give the highest chromatin quality for high IP efficiency and sensitivity for ChIP experiments with gentle yet highly effective shearing forces. Additionally, the Bioruptor provides a precisely controlled temperature environment that preserves chromatin from heat degradation such that protein-DNA complexes are wellpreserved for sensitive, unbiased, and accurate ChIP. Panel A, 10 µl volume: Chromatin samples are sheared for 10, 20 and 30 cycles of 30 sec ON/30 sec OFF with the Bioruptor Pico using 0.1 ml Bioruptor Microtubes (Cat. No. B01200041). Panel B, 100 µl volume: Chromatin samples are sheared for 10 cycles of 30 sec ON/30 sec OFF with the Bioruptor Pico using 0.65 ml Bioruptor Microtubes (Cat. No. WA-005-0500). Panel C, 300 µl volume: Chromatin samples are sheared for 5, 10 and 15 cycles of 30 sec ON/30 sec OFF with the Bioruptor Pico using using 1.5 ml Bioruptor microtubes (Cat. No. C30010016). Prior to de-crosslinking, samples are treated with RNase cocktail mixture at 37°C during 1 hour. The sheared chromatin is then de-crosslinked overnight and phenol/chloroform purified as described in the kit manual. 10 µl of DNA (equivalent of 500,000 cells) are analyzed on a 2% agarose gel (MW corresponds to the 100 bp DNA molecular weight marker). Deparaffinization of FFPE samples is typically performed using a non-polar solvent, such as xylene, or a mineral oil-based method which can be time consuming and messy. Diagenode’s Bioruptor is a superior method for removing the paraffin and rehydrating FFPE tissues in just one solvent-free step followed by a mild crosslink reversal to preserve DNA and RNA integrity. Efficient de-paraffinization of FFPE sections by sonication with Bioruptor 10 µm sections were sonicated for 3 cycles (30 sec ON/OFF at RT) with the Bioruptor Pico. The paraffin has been emulsified and completely dissociated from the tissue section. Chromatin shearing The most important steps for a successful ChIP include both cell fixation and lysis, and chromatin shearing. Diagenode’s Bioruptor uses state-of-the-art ultrasound technology to give the highest chromatin quality for high IP efficiency and sensitivity for ChIP experiments with gentle yet highly effective shearing forces. Additionally, the Bioruptor provides a precisely controlled temperature environment that preserves chromatin from heat degradation such that protein-DNA complexes are wellpreserved for sensitive, unbiased, and accurate ChIP. Shear DNA to the exact fragment size range needed for downstream library preparation -- down to 5 ul of volumes for low inputs! Next-Generation Sequencing (NGS) has revolutionized genomics and biology. One of the most critical aspects of optimal library preparation is the quality of the DNA to be sequenced. The DNA must first be effectively and consistently sheared into the appropriate fragment size (depending on the sequencing platform) to enable sensitive and reliable NGS results. The Bioruptor and the Megaruptor® provide superior sample yields, fragment size, and consistency, which are essential for Next-Generation Sequencing workflows. Programmable DNA size distributions, excellent reproducibility, and high dsDNA yields with the 0.2ml tube holder for Bioruptor Pico. Figure A shows different DNA size distributions of sheared genomic DNA produced by varying the duration of sonication. The different curves depict a specific Bioruptor® Pico run, optimized to produce specific mean sizes and size ranges for NGS. 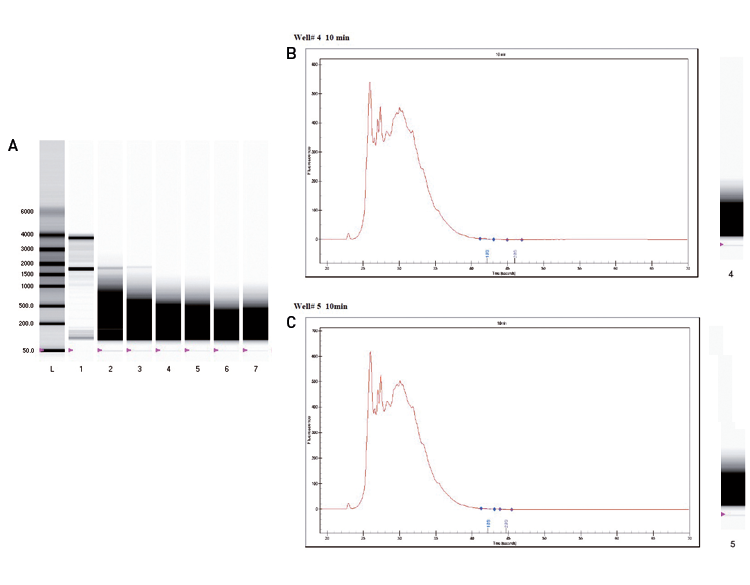 Figure B-D show the excellent reproducibility in DNA shearing compatible with NGS librairies from Illumina, IonTorrent and exom capture protocols from Agilent and Roche NimbleGen requirements. All DNA samples (100ng-4ug/50ul) were analysed on Fragment Analyzer™ (Advanced Analytical). RNA sequencing is a highly accurate and sensitive method to obtain unprecedented information about the transcriptome. The RNA must be fragmented to an appropriate size for sequencing prior to reverse transcription. The Bioruptor provides unbiased RNA shearing for best cDNA synthesis and ensures high quality Next-Generation Sequencing. Programmable RNA size distribution and excellent reproducibility with Bioruptor. 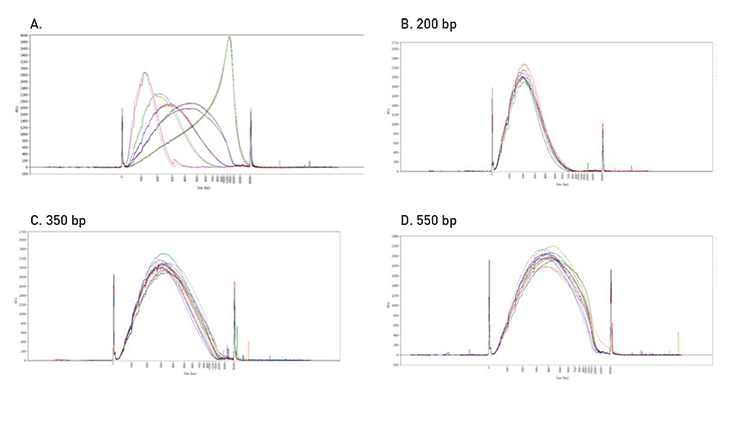 The various panels show different RNA size distributions of sheared total RNA produced by varying the duration of sonication on the Bioruptor. Panel A shows duplicate profiles produced after 5 (lanes 2-3), 10 (lanes 4-5) and 15 minutes (lanes 6-7) (30 sec on/off) of sonication. Lane 1 shows the unfragmented total RNA (starting material). Panel B and C compare the RNA size distributions of sheared total RNA from 2 different experiments. All samples were analysed on Biorad Experion using Eukaryote Total RNA HighSens chip. The combination of the RNA extraction kit and the Bioruptor maintains the integrity of RNA and ensures maximum yield for gene expression analysis. Efficient disruption and homogenization of animal tissues are required to ensure high yield of RNA. Various biochemical and analytical techniques require the extraction of RNA from tissues. Isolating intact RNA is essential for many techniques used in gene expression analysis. In order to obtain optimal yields of RNA, the efficient disruption and homogenization of tissues and cultured cells are required. 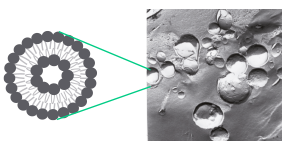 Diagenode's Bioruptor Plus uses state-of-the-art ultrasound ACT (Adaptive Cavitation Technology) combined with unique devices such as beads or tubes acting as sonication « enhancers » or dedicated reagents (such as our RNA extraction reagent) to efficiently disrupt tissues and cultured cells in just one step to deliver high quality RNA extraction. Separate proteins for research or pharmaceutical applications techniques. This protocol, specifically designed for ultrasensitive proteomics, enables high throughput quantitative proteomics study on microdissected tissue samples. The Bioruptor® Pico provided high efficiency protein extraction, essential for the analysis of proteins from micro-scale tissue samples. Mass spectrometry (MS)-based proteomics typically requires multiple sample processing steps. Complex workflows, extensive sample fractionation and proteolytic digestion are time-consuming and restrict technical reproducibility. In this application note, we demonstrate that the straightforward and robust in-StageTip (iST) Kit in combination with sample sonication by the Bioruptor Pico outperforms sample preparation workflows that do not use sonication or that use only heat treatment. Obtain high quality and yields of proteins downstream characterization such as in PAGE, western blotting, mass spectrometry or protein purification. Various biochemical and analytical techniques require the extraction of protein from tissues or mammalian, yeast and bacterial cells. Obtaining high quality and yields of proteins is important for further downstream protein characterization such as in PAGE, western blotting, mass spectrometry or protein purification. The efficient disruption and homogenization of tissues and cultured cells obtained in just one step using Diagenode’s Bioruptor delivers high quality protein. Protein staining of cell lysates (containing both chromatin and soluble proteins) obtained with the protocol developed by Lauriane Fritsch from the laboratory of Slimane AIT-SI-ALI. A. Ponceau S Staining Western Blot of Hep G2 cells lysates obtained usting the Bioruptor. The rectangle indicates the location of histones. B. 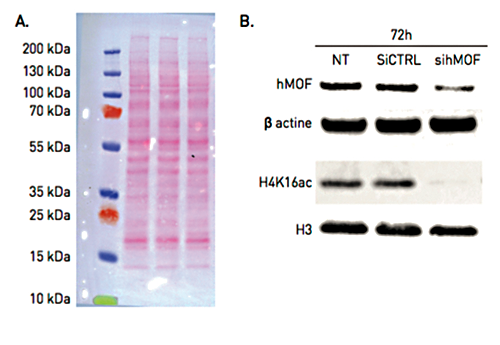 Western Blot of Hep G2 cells transfected and cultivated for 72h with siRNA against hMOF, a histone h4 K16-specific acetyl transferase. Both soluble (hMOf and B-actine) and chromatin (Histone 3 and 4) proteins are obtained on the same cell extract. Prasad Kasturi and F Ulrich Hartl at the Max Plank Institute for Biochemistry are using the Bioruptor for their research using C. elegans. 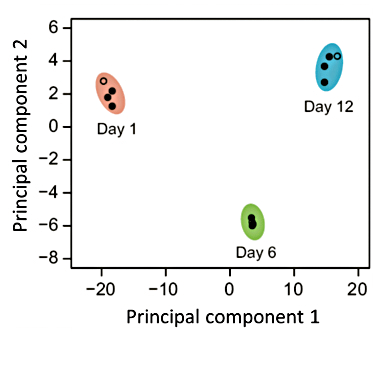 SILAC quantitative proteomics showing the high reproducibility of proteome analysis in multiple replicates of worm samples of different ages (adopted from Walther DM and Kasturi P et al., Cell. 2015). Solubilize proteins gently and easily for disease research studies. The Bioruptor provides high throughput and reproducibility and eliminates direct contact to prevent sample contamination. Sonication is one of the most common methods employed for liposome preparation. The Bioruptor provides high throughput and reproducibility and eliminates the need for direct contact to prevent sample contamination. The precise temperature control preserves the lipids from damage through overheating or oxidation. Peter Stone and Yvonne Perrie from Aston University and University of Strathclyde process MLV generated using the thin film lipid hydration method with the Bioruptor. The 100 µl samples are sonicated 15 minutes at 45°C in the Bioruptor Plus with high power for rapid small scale production of bilayer -loaded liposomes. The Bioruptor Pico and Plus utilize a sonication bath-based rotor. The walls of the sonication bath reflect the ultrasound waves in a random but reproducible pattern. The samples in the tube holder are rotated through the ultrasound field to expose each sample to the same level and intensity of energy to ensure shearing consistency. A unique cooling system providing isothermal processing and the gentle ultrasound preserve and retain the integrity of biological samples and ensure high sample recovery. Figure: Isothermal and homogeneous sample preparation with the Bioruptor. Left panels: Precise temperature control to maintain integrity in sample preparation. The single cycle valve and the 4°C water cooler deliver efficient cooling and reliable performance. Finite element analysis software modeling of temperature around the sample (upper panel). Sample temperature measured with Krystal MV64 thermocouple during sonication cycles (30’’/30’’ cycles) showing the perfect isothermal processing (lower panel). Right panels: Powerful and uniform processing of samples down to 5ul (12 samples) to large volumes of 20ml (3 samples). Bioruptor empowers optimal and reproducible chromatin shearing while preserving high protein integrity (upper panel). Bioruptor’s most advanced ultrasound transmitter and water bath design ensure equal energy distribution. Cavitation energy, expressed as % of the maximum level, is measured with PPB Ultrasonic/Megasonic energy meter (lower panel). What are the effects of ultrasound on biological samples? High powered ultrasound waves can produce gaseous cavitation in liquids. Cavitation is the formation of small bubbles of dissolved gases or vapors due to the alteration of pressure in liquids. These bubbles are capable of resonance vibration and produce vigorous eddying or microstreaming. This mechanical stress has multiple effects on biological samples including; effective chromatin shearing, DNA & RNA shearing, cell lysis and tissue homogenization. When using a probe sonicator, the microstreaming phenomenon is limited to the vicinity of the probe which can generate high amounts of heat and release metal fragments. In contrast, the Bioruptor sonication bath is equally exposed to ultrasound energy allowing for the dissipation of heat and providing uniform absorption of energy. How does it work? Ultrasonic waves generated by the transducer produce longitudinal vibrations (alternating compression and rarefactions) in the water bath (see figure below). These pressure fluctuations create millions of microscopic bubbles (cavities) caused by the negative pressures generated by the rarefaction stage. As the cavities are exposed to the positive pressures, produced by the compression stage, they oscillate and expand to an unstable size (up to 100 microns diameter). Finally the cavities will implode generating pressure extremes and temperatures at the implosion sites. In addition, shock waves and eddies radiate outwardly from the site of cavity collapse. The localized hot spots that last for microseconds can have temperatures of ~5,000ºC, pressures of ~500 atmospheres as well as heating and cooling rates >109 K/s. The cumulative energy generated by this cavitation phenomenon is extremely high and produces intense shearing forces (Figure 1). 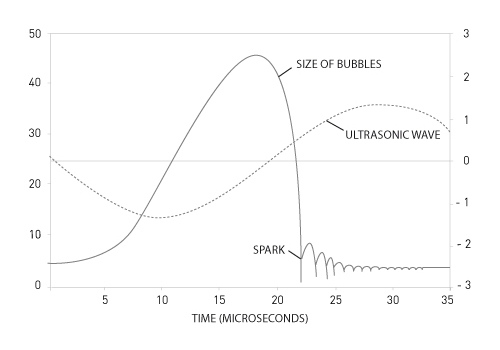 Figure 1: Presentation of bubble size in function of time during sonication process. Bioruptor is the most popular brand in the Epigenetic and Next-Generation Sequencing communities with more than 2000 citations in peer-reviewed journals. Our instruments provide processing performance and recovery unmatched by any other sample preparation methodology. Bioruptor high intensity emission of ultrasounds creating cavitation is ideal for Epigenetics studies of chromatin and DNA methylation, Next-Generation Sequencing, protein analysis and much more. Diagenode's Bioruptor simultaneously shears multiple samples in sealed tubes of 0.1 ml to 50 ml capacity quickly and accurately, providing optimal fragment lengths. The Bioruptor exhibits a laboratory friendly format as it is easily programmable and capable of processing multiple sample tubes, with parallel processing of 3-12 samples. The instrument is able to sonicate different sample volumes to achieve different fragment size ranges. The closed tube format prevents the sample from cross-contamination and aerosol formation. * Time required to simultaneously shear 12 genomic DNA (10ng/ul, 100ul samples) to 200bp with Bioruptor Pico = 13min and Bioruptor Plus = 30min. The Bioruptor Ultrasonicator has multiple advantages over all other sonication devices on the market. Add 0.2 ml microtubes for Bioruptor® Pico to my shopping cart. Add 0.65 ml Picoruptor Microtubes to my shopping cart. Add 1.5 ml Picoruptor Microtubes with Caps to my shopping cart. View more products from the Bioruptor® Pico accessories product category. Add 0.5 ml Bioruptor® Plus Microtubes to my shopping cart. Add 1.5 ml Bioruptor® Plus TPX microtubes to my shopping cart. Add 1.5 ml tube holder for Bioruptor® Standard & Plus to my shopping cart. Add 10 ml Bioruptor® Plus tubes to my shopping cart. Add 10 ml tube holder for Bioruptor® Standard & Plus to my shopping cart. View more products from the Bioruptor® Plus (and Standard) accessories product category.